What Day Of The Week Is December 30? 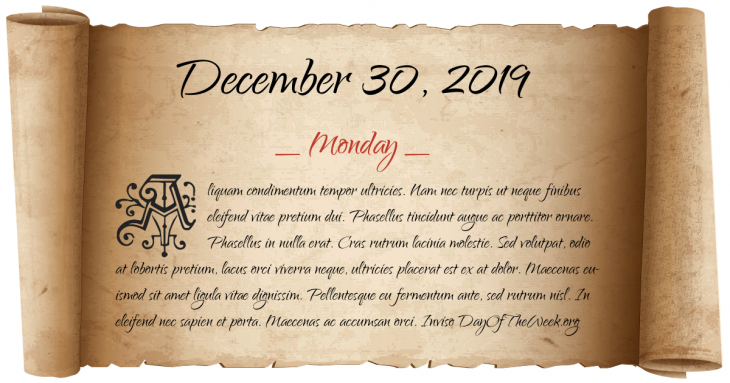 December 30, 2019 is the 364th day of the year 2019 in the Gregorian calendar. There is one day remaining until the end of the year. The day of the week is Monday. Edwin Hubble announces the existence of other galaxies. King Michael of Romania is forced to abdicate by the Soviet Union-backed Communist government of Romania. The Cole Porter Broadway musical, Kiss Me, Kate (1,077 performances), opens at the New Century Theatre and becomes the first show to win the Best Musical Tony Award. Who were born on December 30?